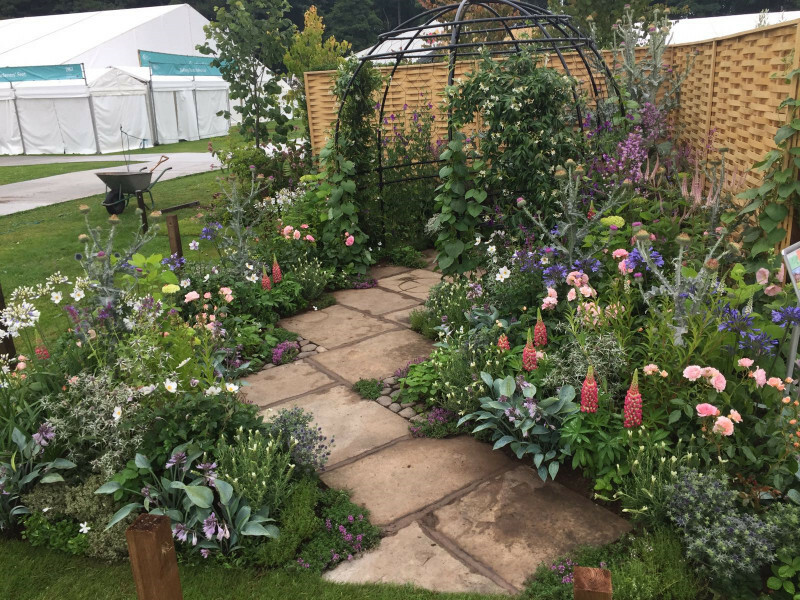 Paul Gibbons Landscapes Ltd installed the hard landscaping for one of the back to back gardens at the RHS Tatton flower show. 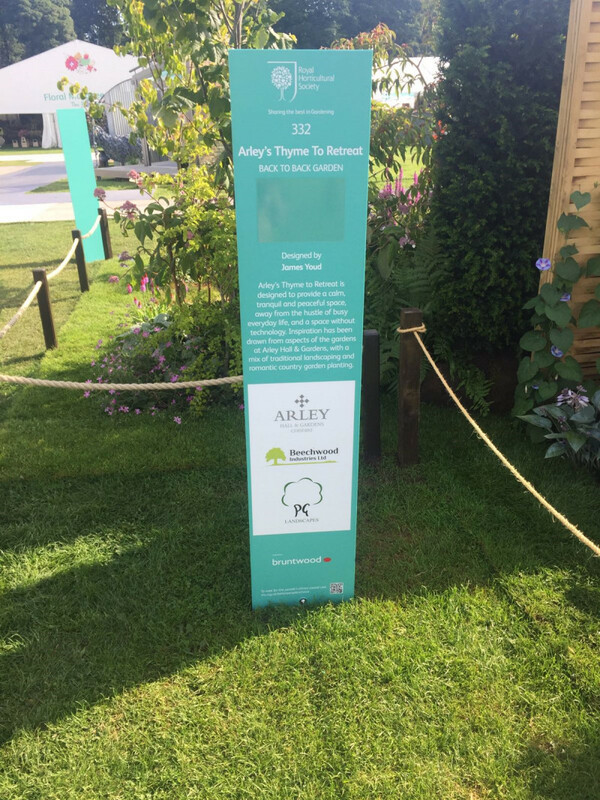 The garden was Arley’s Thyme to Retreat, in which an angled yorkstone path was laid, along with small pebble areas to house creeping herbs and using reclaimed materials from Arley Hall and Gardens. 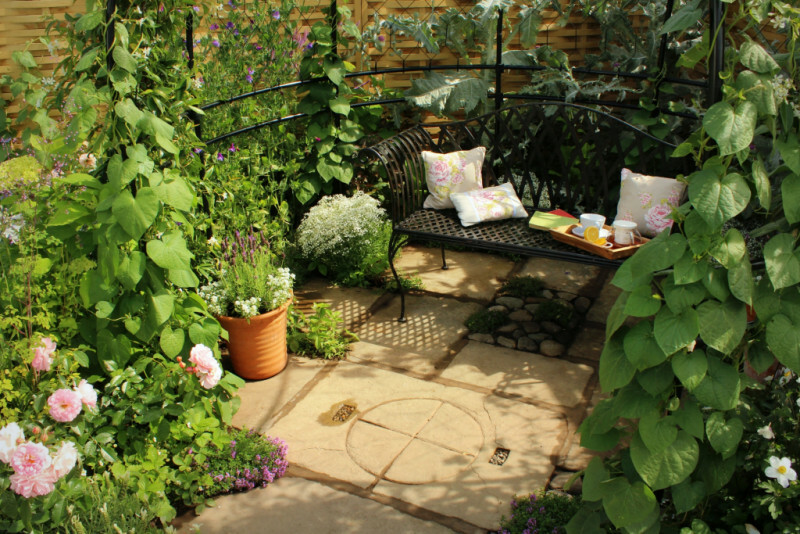 As a feature, an antique cheese stone was used. 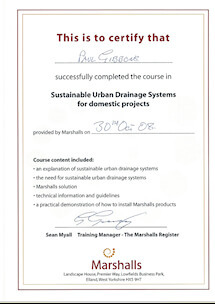 The circle and cross are shallow drainage channels that were to direct the excess whey out of the cheeses. 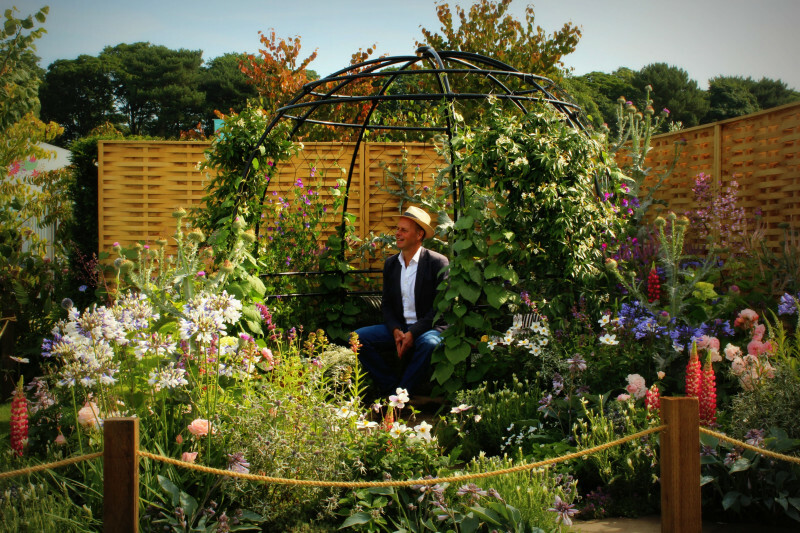 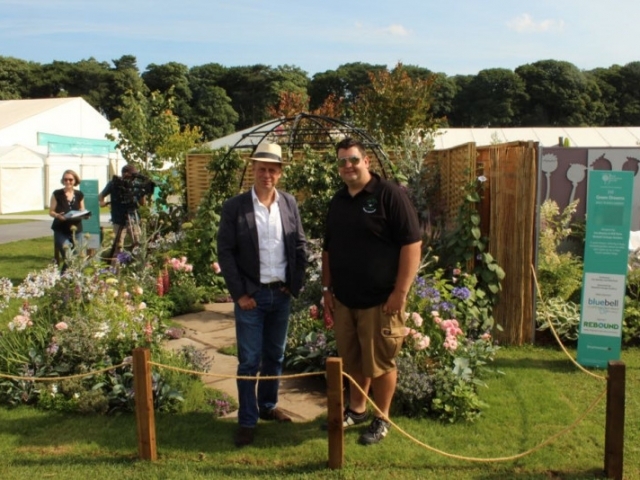 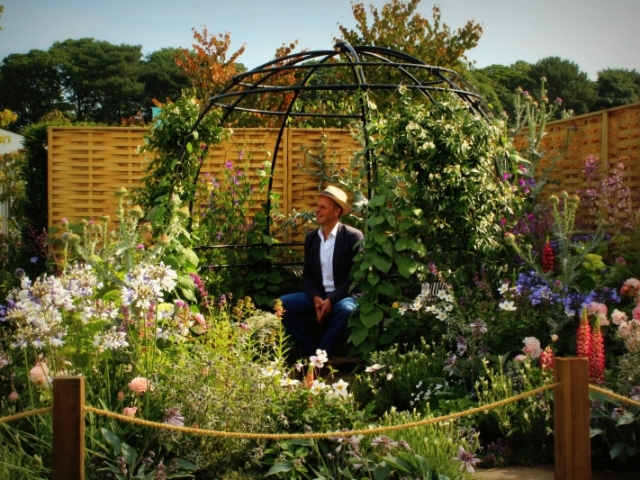 Joe Swift filmed on the garden for the BBC Tatton flower show program. 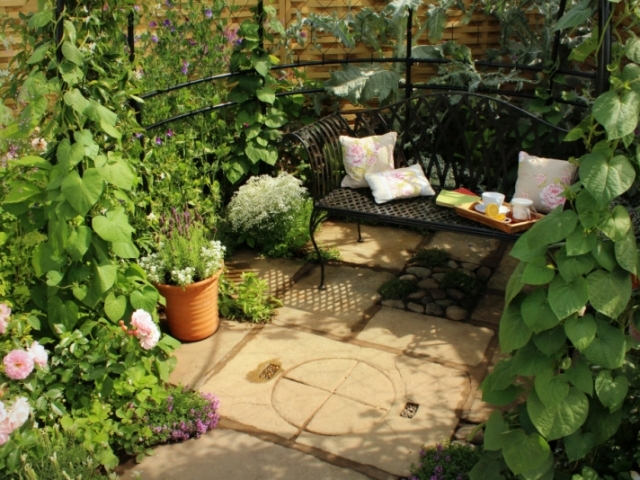 The garden went on to achieve an RHS Silver Gilt award. 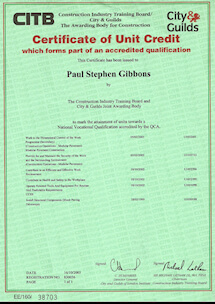 As an Approved Contractor we benefit from the latest technical, training and service support which ensures we are briefed on the latest standards and products. 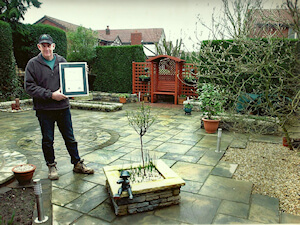 Marshalls hold seminars and conferences throughout the year to keep us updated and this year (2012) we were awarded this year to a Marshalls 10 years longevity award. 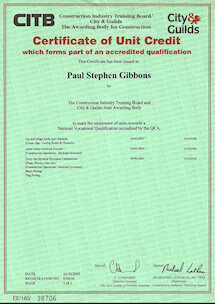 This is an achievement to be proud of as it proves we have constantly kept to their high standards of installation. 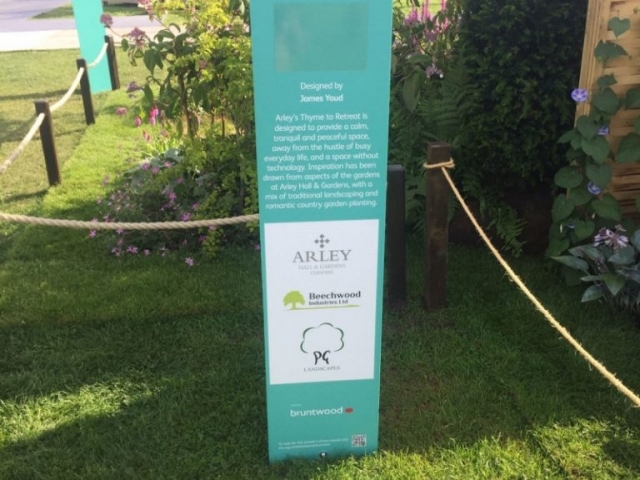 Years ago a scheme was set up by Marley who were one of the top manufacturers of paving products at the time, for approved contractors and installers. 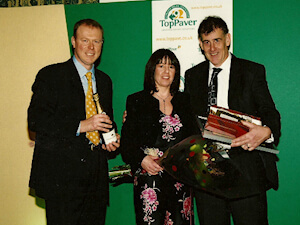 They were then taken over by Tarmac TopPave who transferred members of that scheme to their Tarmac TopPavers Approved Contractor Scheme. 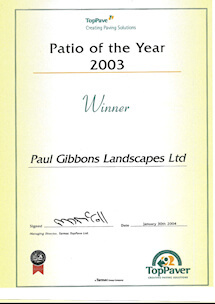 We were members of that scheme and in 2004 we had the pleasure of being awarded at the groups annual conference in Bristol the nationwide winner of TopPave’s Patio of the Year 2003. 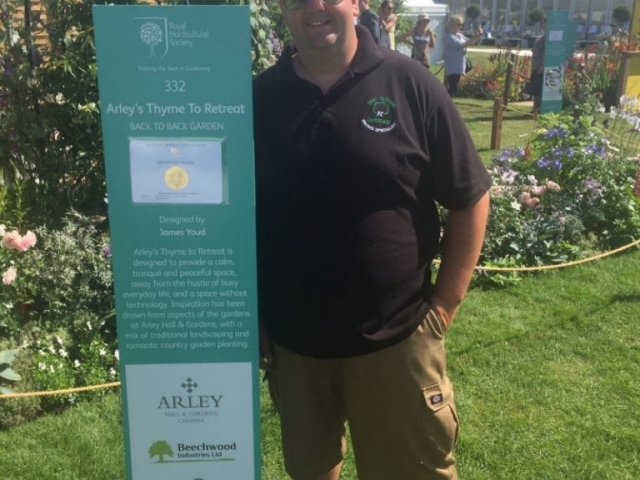 A prestigious award and one we are proud of. 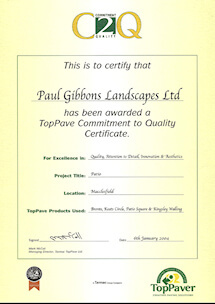 This was awarded to us by Tarmac TopPave on attention to detail, innovation and aeshetics on a patio constructed in Macclesfield. 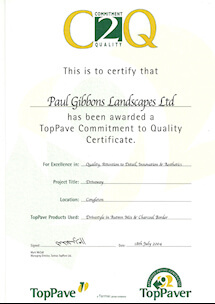 We also achieved a Commitment to Quality Award for this patio along with a driveway in Congleton. 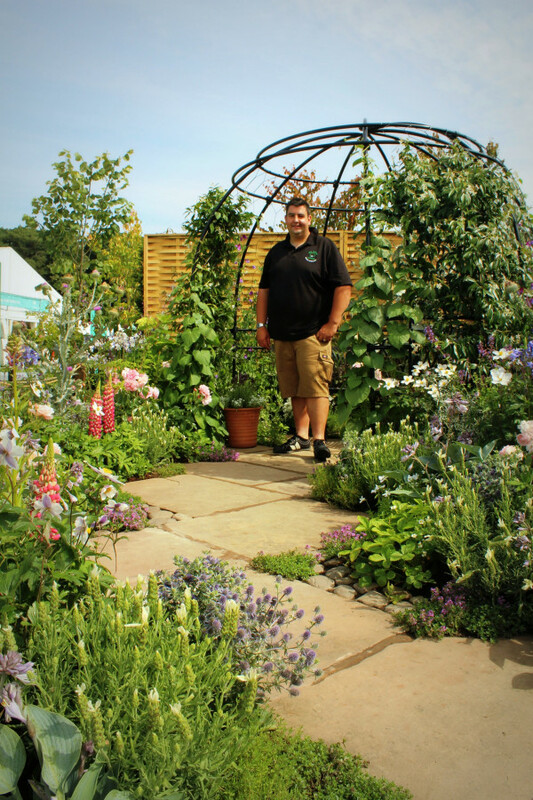 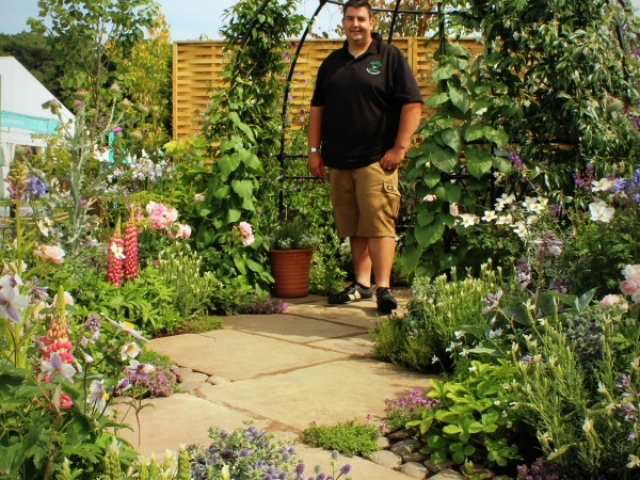 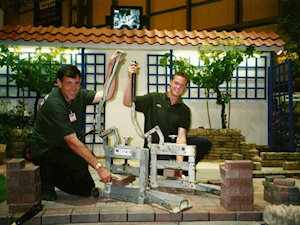 Through the above scheme Paul and an employee Joe Manning took part in a contest held at the BBC’s Gardeners World Live Exhibition at the NEC Birmingham in 1995. 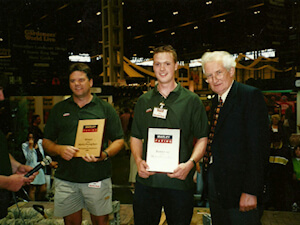 This was a national Marley Paving Race to prepare a 2m x 1m area and lay 100 block paving bricks in that area. 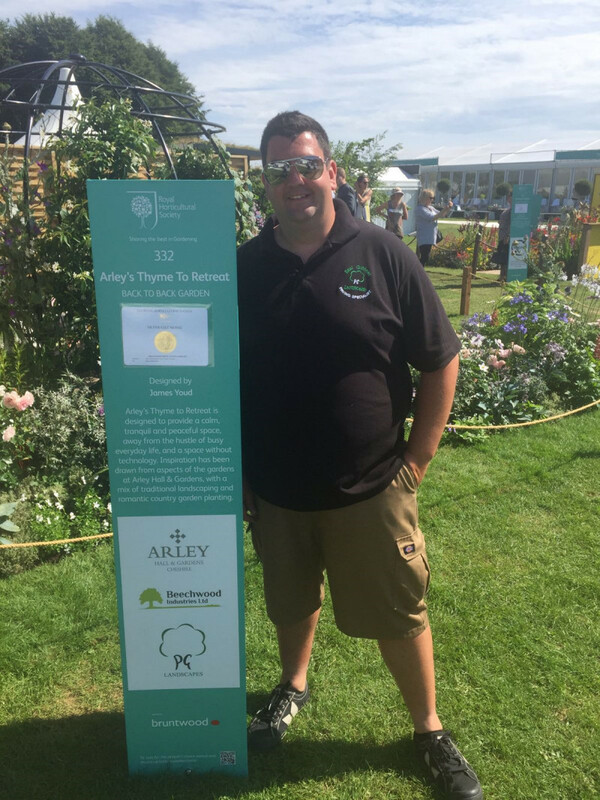 Joe came 2nd laying his blocks in 4 minutes and 41 seconds! 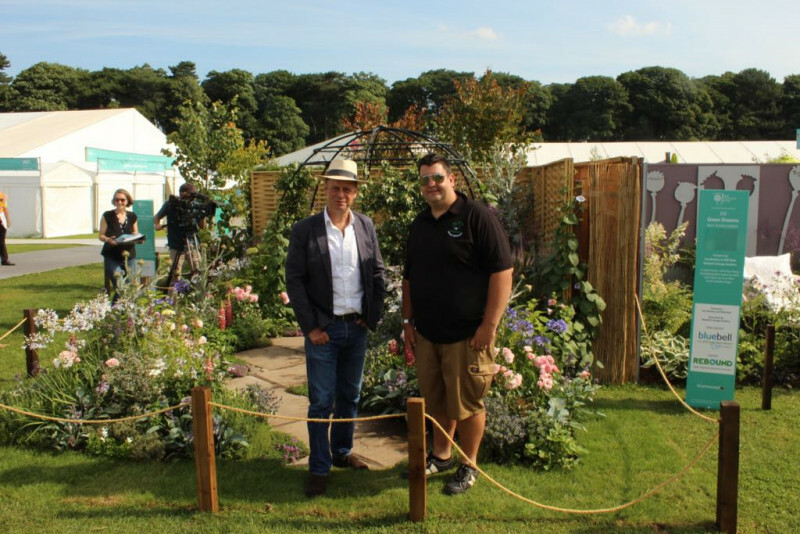 Paul 4th in the race and Joe was awarded his runners-up plague by gardening celebrity Peter Seagrove.